Bumper Crop is my attempt to celebrate the intersection of the garden and the kitchen — an intersection at which many of us love to linger, I think. 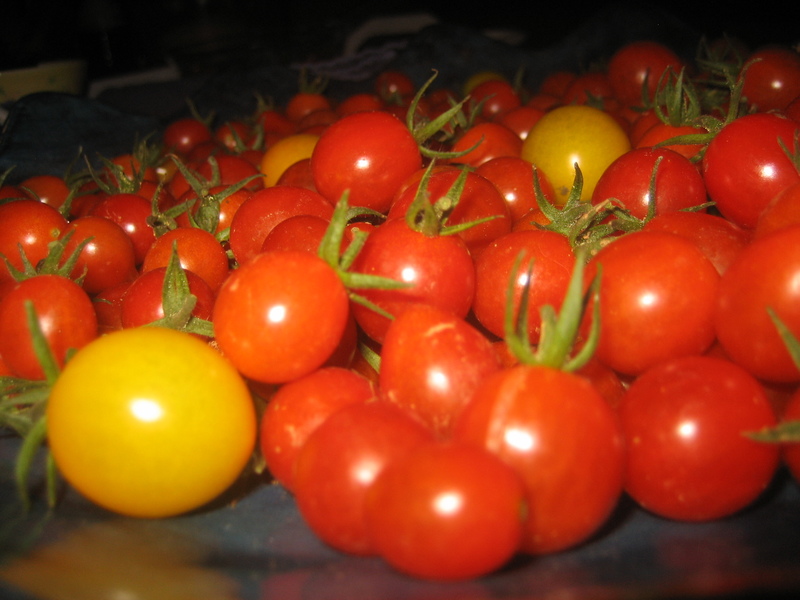 This week’s Bumper Crop is tiny, adorable tomatoes. How grateful I feel, in late September, to have lovely little tomatoes practically bursting off the plants. 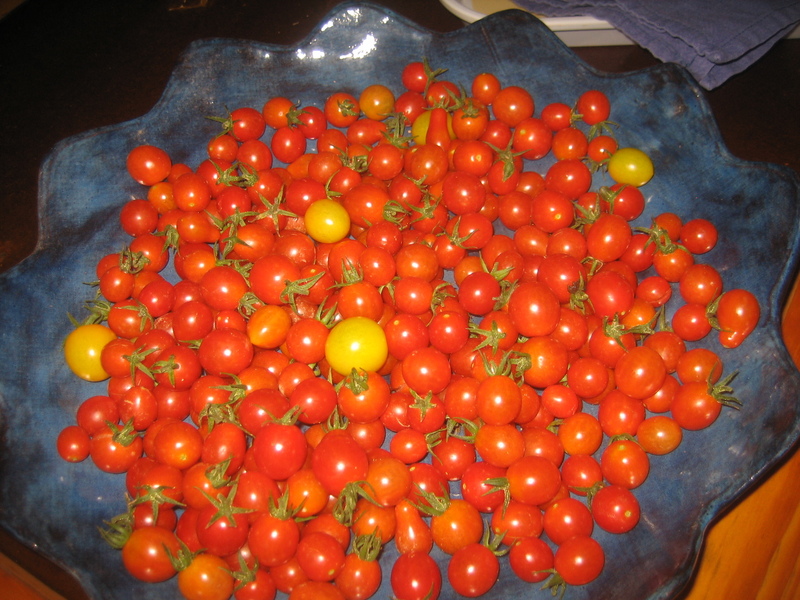 The tomatoes in the photo are a mix of Jaspers and Sun Golds from Johnny’s Selected Seeds. I have been so pleased with these tomatoes. They are both prolific and delicious. We consume a lot of these little guys while harvesting. Many of them I pitch over the fence into the chicken yard, and the birds have a great, squawky time snapping them up. The tomatoes that make it to the house, I put on a glorious Rebecca Wood Pottery platter (which was a very generous wedding gift years ago). That color contrast — glossy shiny red and yellow against glossy shiny dark swirly blue — I love it. It makes the tomatoes look all the more appetizing, and so I eat a lot of them one-by-one or in small handfuls as I’m mousing around the kitchen. But this wouldn’t be a true Bumper Crop unless there were almost too many tomatoes to use up, right? Luckily, no matter how many of these I eat au naturel, there are plenty left to make one of my favorite things: Flatbread with Schmeer and Salad. First, prepare the tomato salad: slice small cherry tomatoes in halves, julienne a few leaves of basil, sprinkle with salt and pepper. Using a spoon, measure out the olive oil and red wine vinegar: 5 spoonfuls of olive oil to 2 spoonfuls of vinegar. Mix. Now, the flatbread or naan: sprinkle one flatbread lightly with water. Toast in the oven for just a few minutes to make it warm and tender. The final ingredient you’ll need is some good, creamy hummus. I would like to tell you I make my own hummus from scratch, but I have wasted too many fine chick peas and expensive jars of tahini and never got a hummus that I love as much as this prepared brand. Life is too short–I just buy hummus so I can really enjoy it. 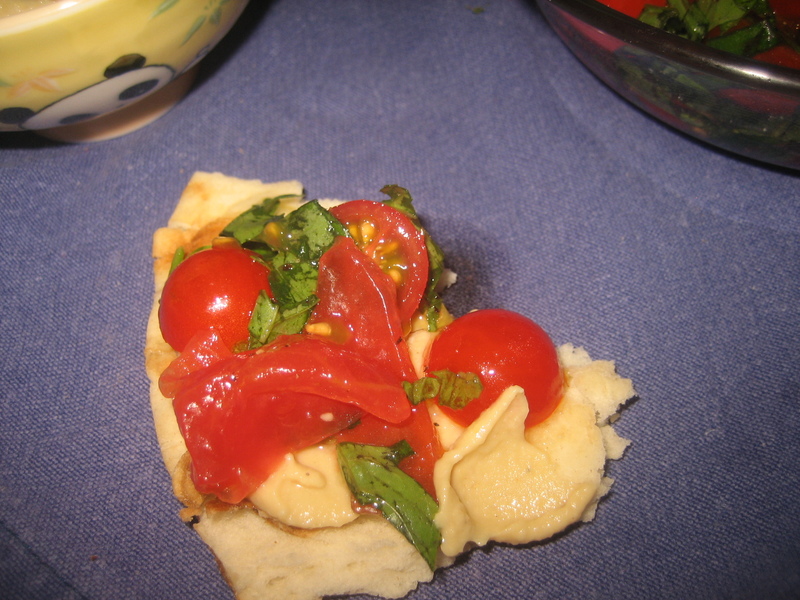 Now for assembly: Tear off a piece of flatbread, schmeer on some hummus, spoon on some tomato salad and munch. This part is messy, as the tomato-ey, vinegary oil dribbles down your hand and chin, so have a napkin handy. My two wishes for you today: that you have tomatoes still spilling out of your garden in September, and that you make and enjoy this dish as much as I do. Bon appetit! 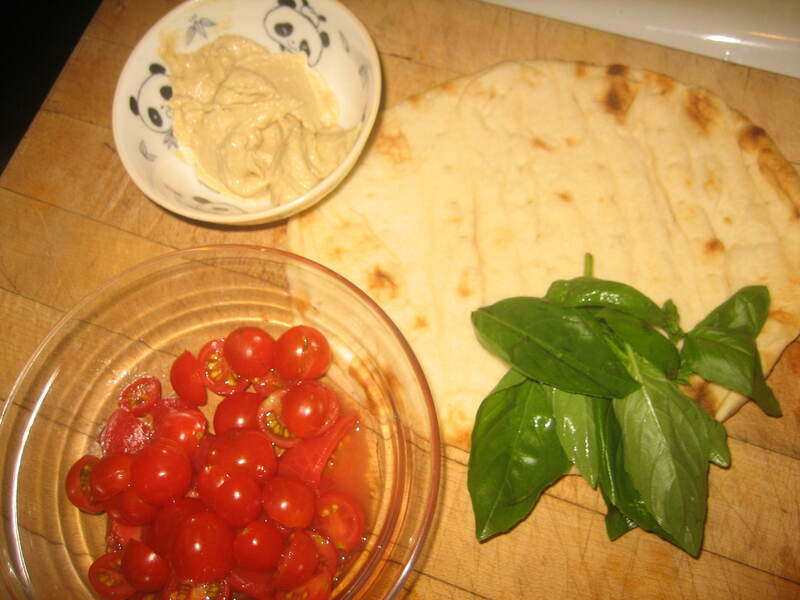 This entry was posted in Cooking, Gardening and tagged basil, bumper crop, cherry tomatoes, flatbread, hummus, Jasper tomatoes, Johnny's Selected Seeds, Rebecca Wood Pottery, Sabra hummus, Sun Gold tomatoes.